This is the first part of our how to windsurf guide that will give you the basic steps necessary to enjoy windsurfing. So, summer is just around the corner (we all hope!) and its time to get out there and learn something new that will be good exercise, sociable and fun! Part 1 of our guide talks you through the preparation required before you even get out there on the water. There are several steps, that if taken, will make your first windsurfing experience much smoother & more enjoyable. 1. Physical Preparation – Now a days it is fairly common knowledge in the sporting world that you need to prepare your body for the physical actions it is going to have to perform. The more physically prepared your body is the easier you will find the core actions required to learn to windsurf. For example, if you include some basic squats (no weights, just the action itself will be enough) in your pre-windsurf lesson training schedule, you will automatically find the action of pulling the windsurf sail out of the water (uphauling) much easier to perform. 2. Mental Preparation – You may have heard of the term visualisation and understand what it means but do you actually ever put it into practice? In sports, visualisation can really make ALL the difference when learning a new skill or move. The process is very straight forward, you just have to calm your mind and picture yourself going through the movement/skill you are trying to learn. This process literally programs the muscles in your body to do what they need to do and before you know it you will be completing the task at hand, windsurfing off into the sunset! Seriously, by utilising the above visualisation techniques you WILL learn how to windsurf sooner and more effectively than without! 3. Take Windsurfing Lessons – taking lessons to be shown the actual step by step skills required to learn the basics of windsurfing, including uphauling, static 180 turns, sailing position, steering and if you are going to take a full beginners windsurfing course, how to windsurf upwind/tack & how to windsurf downwind/gybe. All these skills are very specific and detailed but if shown by an experienced instructor, you can learn them easily within the scope of a beginners windsurfing course. The money spent on taking proper windsurfing lessons is so worth it! We so often see well meaning family members or friends trying to help others learn the basics of windsurfing, where the poor learner is making the same mistakes over and over again when all it would take is one small adjustment to get them windsurfing off across the bay! 4. Focused training with muscle memory – By breaking a skill/move down into its component parts and repeating them over and over at slow speed in a controlled environment is an amazing way to condition your body into achieving results. When you are actually out windsurfing there are a lot of factors at play (the wind, balancing on the board, holding onto the sail) and it can take much trial and error to eventually figure out what is going. With some muscle memory training, once you actually get out on the water your body will just go into auto pilot mode thanks to the repeated slow motion training you have been practicing over and over again on dry land. At the Poole Windsurfing School we use a full motion on land windsurf simulator to get students practicing the exact same physical actions they will need to repeat once out on the water. Muscle memory training is an essential part of learning how to windsurf that everyone should practice if they want fast progression. 5. Set goals – As cheesy as it may be, setting achievable goals is a really good way to push your learning forwards to the next level. The goals you set have to be achievable otherwise the fun of learning just isn’t there anymore. There you have it, a simple step by step process to follow, from preparing physically then mentally before taking windsurfing lessons with focused muscle memory training and finally pushing your progress by setting some achievable goals. If you follow the above steps, in order, then your introduction to the sport of windsurfing will be so much smother and your learning curve WILL go through the roof! In our How to Windsurf Guide- Part 2 we will give an exact plan of action that has been proven to be the most effective way to take a complete beginner through the learning process and take them onto become a proficient windsurfer, all in the least amount of time. Sign up to our ‘Top Windsurfing Tips & News’ to automatically be sent the following installments from our How to Windsurf Guide, as and when they are released. I would like to book a lesson at pool harbor. Can you tell what date or day suits best and what you can do, I am a complete beginner and am not very confident in the water. 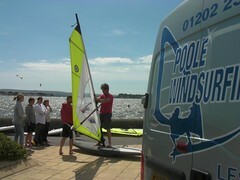 Hi Simon, we can definitely get you started with a beginners windsurf course. This time of year is a little fresh but you can choose whether to start now or book a course ready for the spring once it warms up a bit in the water! We run courses 7 days a week, to book you just need to give us a call on 01202 237247 and we can discuss exact dates/time and ask for payment so we can then reserve your space. I will email you more details about the beginners windsurf course options. Special Windsurfing Offers for limited time only!